The enormous box containing the HTC Vive arrived. Out on a bike ride, I nearly missed the delivery, but the caught the Fedex driver just as he left the “signature required” note on my door. The HTC Vive shipped in a box that resembled a giant mobile phone package — befitting its HTC roots, I suppose. I’m not writing a lengthy review; there are already a bevy of good reviews out on the webiverse. Consider this my personal take, a return to virtual reality if you will. Almost 20 years ago, I reviewed the Forte VFX1 for Computer Gaming World. One of the first VR headsets for the PC, the VFX1 used two low-resolution LCDs in a bulky helmet, and included a single controller puck. The technology of today’s VR headsets is vastly better, but they still seem heavy and a little clunky. I’ve worn both the Rift and now the Vive, and both still pull my head forward a bit, straining my somewhat fragile neck. 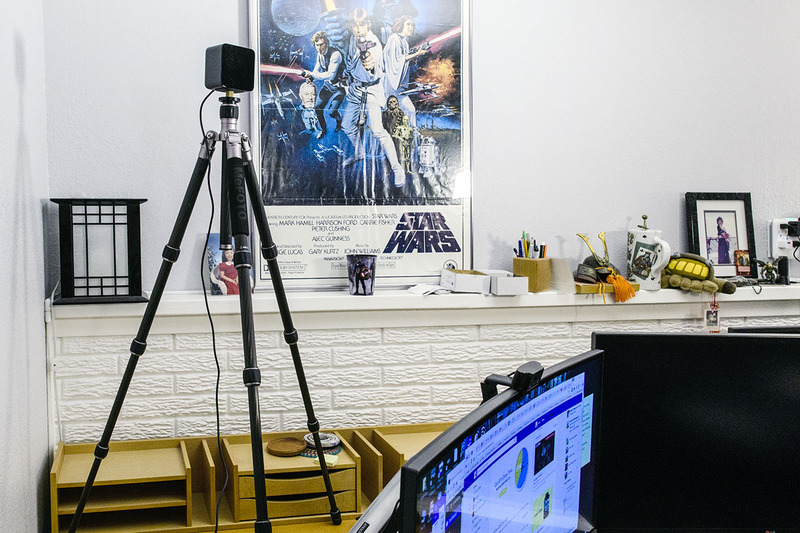 Setting up the Vive turned out to be surprisingly easy. The main issue revolved around where to put the two small base stations. They need to be located within view of each other as well as within view of the headset and two controllers. I wasn’t quite ready to start drilling holes in my walls yet. Then I realized my corner desk includes a large, unused area behind my monitors, so mounting one base station on a tripod and sticking it behind my monitors solved that issue. Sticking the other base station on a bookshelf across the room was a piece of cake. I encountered one minor challenge when attaching the interface box to my PC. 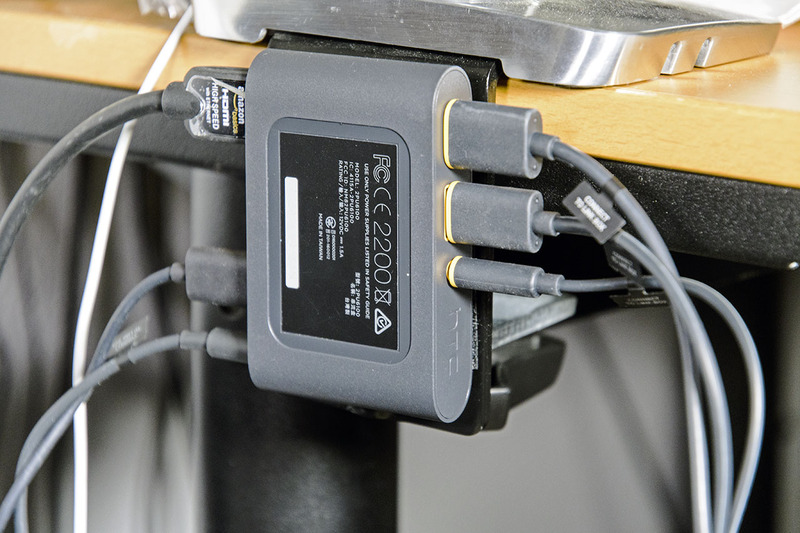 When I noticed the mini-DisplayPort connector, I celebrated — too soon, as it turned out. For whatever reason, the Vive refused to recognize a DisplayPort connection from the GTX 1080 graphics card. I finally dug up an HDMI cable, which worked fine. Software installation went quickly, as did initial configuration and that inevitable day one firmware update. The Vive’s interface box weighs next to nothing. That meant it would easily drop to the floor or dangle from the desk when actually using the headset and walking around. Double-sided velcro sticky tape came to the rescue, with the interface box now firmly attached to the side of my desk. My basement office seems pretty large, but the 4 x 4 foot table in the middle houses the podcasting setup — one of my main concerns about room scale. My wife inadvertently came to my rescue by moving her home office upstairs, so I moved the podcast setup into the now-empty room. I still had to move some things around, but I finally achieved the magical 2m x 2m square area. Calibrating the area ended up more onerous than I expected, mostly because of all the stuff taking up floor space, including camera lighting stands, chairs, floor lamps, and other PCs. Once through all the setup difficulties, the Vive worked pretty well initially. The headset actually fit quite comfortably over my glasses, a pleasant but welcome surprise. I initially tried using over-the-ear headphones, but the whole combination proved overly bulky, so settled for a good pair of Sennheiser in-ear monitors. I added a few games from Steam and was off and running. Image quality is highly dependent on where your eyes are positioned. Minor slippage makes the whole scene look blurry. When in the sweet spot, though, VR through the Vive can be breathtaking. Stability remains a concern. The main issue seems to be games remaining resident on exit, which blocks other games from running. It’s just frequent enough to be annoying, but doesn’t happen with every game. About every third time I ran SteamVR, the application wants to recalibrate my room. 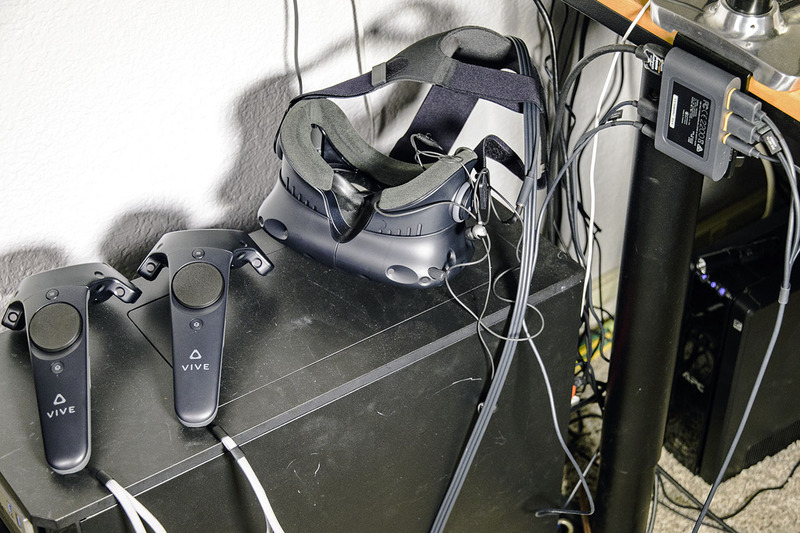 Despite being in clear line-of-sight of the base stations, the system “lost” the controllers twice, which meant exiting SteamVR and restarting. The user interface impressed me overall — so far, the SteamVR interface and most of the game interfaces seemed amazingly straightforward. Even the relatively complex UI built into Google’s Tilt Brush 3D drawing app worked well. The only application navigation that still puzzles a bit is Universe Sandbox. The Apollo 11 VR application is stunning. I’ve yet to encounter any vertigo or nausea while playing, but did feel weirdly disoriented when sitting down in front of a 2D display once exiting VR. I can’t get the front camera to work, but haven’t pursued it after one failed attempt. Thank the FSM for the Knock Knock feature, which I only discovered when I nearly jumped out of my skin when my wife tapped me on the shoulder. I like that the settings allow the audio interface to automatically switch to the correct audio output when you start and exit Steam VR. So I’m giving the Vive a tentative thumbs up, but I need more time in-game. I’ll post further updates on VR experiences and games going forward, but the hardware and UI remains an impressive accomplishment. I’m not usually a grammar nazi, but “Stability remains a concerns” needs to be fixed. Good article, though. I like the more realistic reviews of the current crop of VR HMDs. 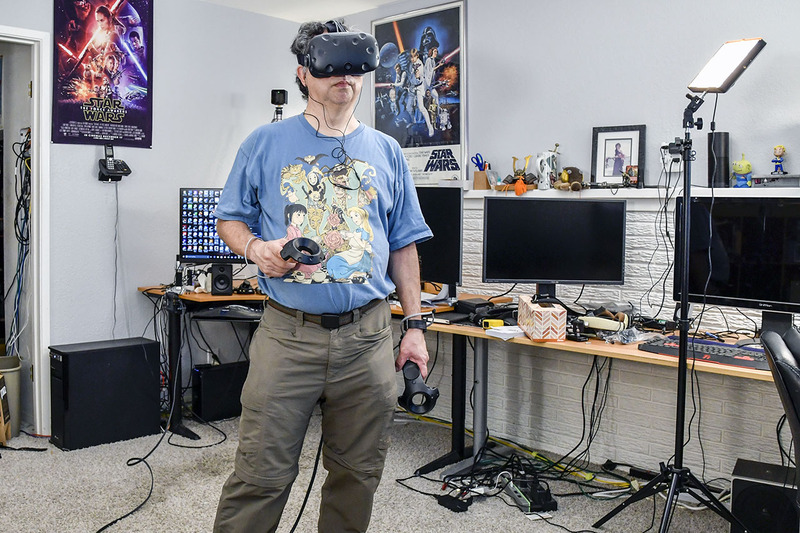 All too often I see these grandiose interpretations of VR and think, “did they just try the same thing I did?” Being more truthful about our experiences will, in my opinion, help VR actually take hold and gain popularity in the not-too-distant future.